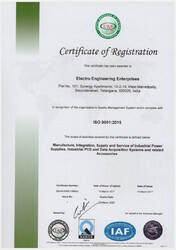 Established in the year 1984, we, “ Electro Engineering Enterprises”, are an ISO 9001:2015 certified organizations, which is engaged in manufacturing, supplying and exporting a comprehensive assembly of Industrial PC, Panel PC, Data Acquisition Systems, Power supply systems and Communication & Networking Products. These Networking products are designed using high peripherals. We have constructed a sophisticated infrastructure, which aids us in handling the business related activities in a streamlined manner. Facility is suitably installed with modern machines and advanced technology that aid us in offering an unmatched range of networking products. In addition to this, our personnel make sure to segregate the premises in various sections such as manufacturing, quality testing, warehousing and administrative. This division is done to ensure that each business dealing is executed smoothly and systematically. Owing to the wide distribution network and ethical trade practices, we are able to muster numerous customers such as BEL, NTPC, NPCIL, GAIL, ONGC and HPCL, to name a few. We ensure to export these networking products to major markets such as Indian Subcontinent, East Asia, Middle East and South East Asia. Various DRDO Laboratories, Defence Production units, such as BEL, HAL, BDL, ECIL. Under the able guidance of our chief executive, 'Mr. Ravindra Watve', we are able to place a strong foothold in this domain. His wise managerial skills, commendable knowledge, rich experience and practical approach have enabled us to win the trust and confidence of clients worldwide. Electro Engineering Enterprises believes that quality is the crucial factor deciding the fate of an organization. Henceforth, our organization does not accept any sort of compromises made in terms of quality. In this direction, we manufacture the complete range of Data Acquisition Systems, Power Supply Devices and Communication & Networking Products in strict accordance with the global quality standards. For this, we source the raw material required during the fabrication process from some of the reputed vendors of the market. Further, the complete range is thoroughly tested on varied parameters to assure flawlessness & zero-defect. Owing to the quality-approved range & total quality management policy followed by us, we have been able to attain ISO-9001-2015 certification from DNV, The Netherlands. We are an ISO 9001:2015 certified name, which is one of the renowned manufacturers, suppliers and exporters of Data Acquisition Systems, Power Supply Devices and Communication & Networking Products. This range of networking products are developed utilizing high grade components & peripherals. are an ISO 9001:2008 certified name, which is one of the renowned manufacturers, suppliers and exporters of Data Acquisition Systems, Power Supply Devices and Communication & Networking Products. This range of networking products are developed utilizing high grade components & peripherals. In addition to this, power division products offered by us are made using components sourced from Mean Well Taiwan. Our firm also source the peripherals used for manufacturing different products from renowned vendors such as Advantech, IEI, ICOP, ICPDAS, Planet and Wingtop. The offered range is widely appreciated in the market for its performance, efficiency, reliability and low power consumption. We are a prominent name, which is engaged in offering an unparalleled range of Data Acquisition Systems, Power Supply Devices and Communication & Networking Products. Manufactured using superior-grade components, the range is widely appreciated by the clients for excellent performance, robust construction, reliable performance and longer functional life. Efficient manpower serves as the driving force behind the successful journey of an organization. Henceforth, we have employed a competent team of expert professionals, which helps us in providing the customers with a quality-approved range of Data Acquisition Systems, Power Supply Devices and Communication & Networking Products. Selected after a strict recruitment process, our professionals hold in-depth knowledge & experience in their respective domain. Owing to this, our professionals direct their untiring efforts towards attaining the organizational goals in timely manner. For this, our professionals frequently interact with the clients to know their exact requirements & serve them accordingly. Owing to the consistent efforts of our team members, we have been successful in scaling new horizons in this domain. Over the years of experience in the industry, we have been able to provide the customers with quality-approved Data Acquisition Systems, Power Supply Devices and Communication & Networking Products. In the direction of complete customer satisfaction, we undertake stringent quality-testing measures, ethical trade practices, fair business deals and flexible transaction options. Owing to these approaches, we have been able to earn the trust & confidence of some of the major clients of both national as well as international repute. Being a patron-centric organization, our prime objective is to attain the utmost contentment of the customers. In this direction, we carry out all our business operations with complete transparency in dealings & policies. Further, we utilize only quality-approved raw material and genuine tools & instruments during the fabrication process. We also frequently interact with the clients to understand their specific requirements (if any) and serve them accordingly. Owing to these attributes, we have been successful in garnering the faith of a large number of customers all across Indian Subcontinent, East Asia, Middle East and South East Asia.